Prosper Lavalley and a number of other voters residing in township 135, range 42, (now known as Maplewood township) appeared before the county commissioners on July 26, 1880, with a petition properly signed by a majority of voters of said township, asking for its organization as a civil township under the name of St. Agnes. The board granted the request of the petitioners and designated the house of Lavalley, a prosperous citizen living in section 28, as a place for holding the first election on the 14th of the following month. About two years after St. Agnes was organized the residents of the township became dissatisfied with its name and as a result they appeared before the county commissioners with a petition, dated February 23, 1882, which contained the following names: W. H. Shadville, E. W. Seeper, C. J. Brockett, F. J. Young, B. C. Emery, Peder P. Anderson, Christ Olson, Christ Fodgberg, Gustav Shay, A. Anderson, C. A. Yungner, A. Wagstrain, Peter Miller, John Olmsted, Johannes Nilson, A. Fodgberg, Peter Pederson, Hans Olsen, C. J. Herman, K. D. Thompson, Lars Rassmussen, P. E. Peterson, Peder Ellinson, Erik Erikson, P.S. Johnson, John Leeper, Ben Grant, J. B. Bishop, Henry Shachirk, H. O. Wing, Ole H. Wing and Ole Olson. This petition, presented to the county commissioners on May 2, 1882, asked that the name of township 135, range 42, be changed from St. Agnes to that of Forest Lake or Maplewood. The commissioners granted the request on the above mentioned date, and as there was another Forest Lake in the state, the name was changed to Maplewood which it retains to the present day. For some reason the citizens of the township were not satisfied with the name Maplewood and in the summer of 1890 presented a petition to the commissioners asking that it be called St. Johnsbury or St. Agnes. This petition, dated June 25, 1890, contained the following names. Prosper Lavalley, W. H. Lavalley, George Blanchard, B. C. Emery, Charles Emery, Christian Pedersen, Peter Pedersen, P. T. Anderson, Ole Oleson, Hulston Wing, Ole H. Wing, F. E. Dolphin, Joseph Raney, S. N. Lavalley, Mitchell Mitsel, Frederick Kulson, Peter Willer, Henry Shadville, Joseph Shadville, William Shadville and John Olmstead. The commissioners refused to grant their request and since that time no effort has been made to change the name of the township. Maplewood township has a very rugged appearance. 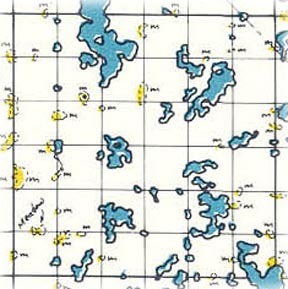 More than a score of lakes are to be found within its limits, the largest being Lida, Beers, Crystal, Twin, Long and Fremont. Although the surface of the township is decidedly broken, yet there is much excellent farming land. The township lies wholly within the basin of Pelican river. There has never been a village in the township. Before the introduction of the rural free delivery a postoffice was maintained at Arthur and later at Worden; the former being in section 12 and the latter in section 22. The present town hall is in the center of section 22. Churches are found in sections 8, 15 and 27, and a cemetery is maintained in connection with each church. The present township officers are as follow: Supervisors, O. H. Nodsle, J. E. Hauger and Andrew Dennison; clerk, C. A. Mesna; treasurer, Iver Anderson; assessor, H. Halloway; justices, Richard Reedy and H. B. Emery; constables, E. C. Southwick and Max Wait. Places of birth for Maplewood Township in the 1905 state census.